It is the mission of the Nicholas Elementary School community to assist every child in reaching his or her full potential. This goal will be achieved by providing all students a nurturing environment in which to become responsible, critical thinkers, who are of strong moral character and can lead productive lives in this multicultural technologically focused society. 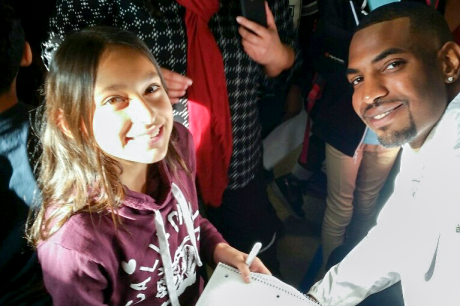 A big thank you to Seattle Seahawk Linebacker Eric Pinkins who visited Nicholas Elementary last week to speak to students. He talked about getting a good education, pushing yourself to succeed, never giving up and having respect for yourself and others. Students had time for a Q&A after the presentation and asked great questions. All 14 student-led Green Teams participating in Project Green 2016 were awarded funding for water conservation projects at a ceremony on Tuesday. Initially, only the teams that scored highest on a Project Green rubric were to be awarded funding. But because some of the schools proposed fairly inexpensive projects — Bret Harte Elementary asked only for mulch and planter boards — the district decided to fund all 14 proposals, said Project Green Specialist Rachel King. 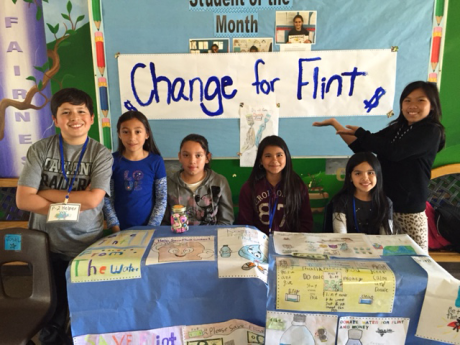 The students in Anna Rudolph’s fifth grade class at Nicholas Elementary School are raising money to provide children in Flint, Michigan, with clean drinking water. The money donated goes to a website which in turn provides bottled water to the Flint community. 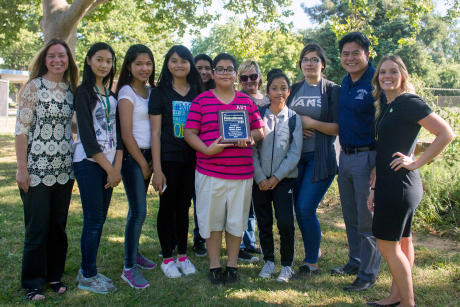 The Nicholas students are a part of the school’s Project Green team and have been looking into the drought and water crisis around the world and in the community. 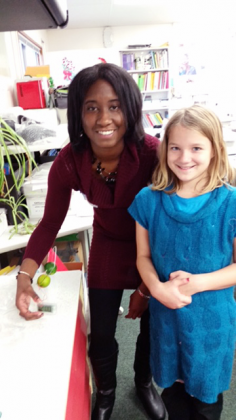 NASA engineer Leslie Smith visited a fifth-grade classroom at Nicholas Elementary School this week, encouraging students to pursue careers in science. Smith is a mechanical design engineer at NASA’s Marshall Space Flight Center in Huntsville, Alabama. 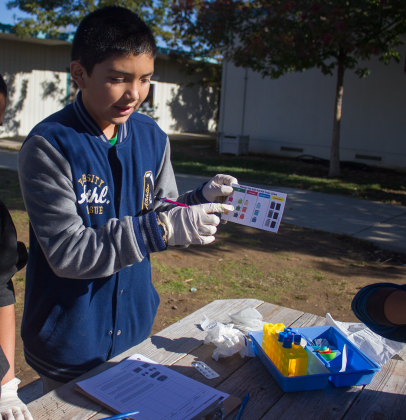 Students at Nicholas Elementary School demonstrated their new garden science curriculum at an event today with SCUSD partners Jamba Juice and GENYOUth. Jamba Juice and the GENYOUth Foundation have given 14 school grants to SCUSD campuses totaling $36,000. Schools are using the funding to either start gardens or maintain existing ones. School gardens are becoming increasingly important as outdoor, living science labs where students can study ecosystems, learn about environmental sustainability and examine healthy food choices. Sometimes getting caught is good. I Got Caught Attending School is a joint effort with SCUSD, KSFM 102.5, and Natomas Walmart to increase attendance rates in our elementary schools. 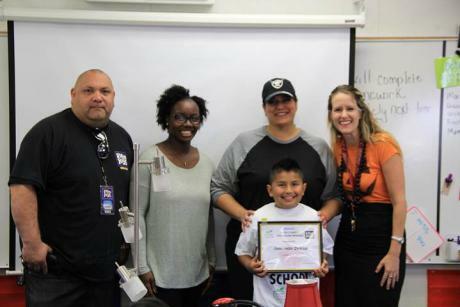 Recently, students at Oak Ridge Elementary and Nicholas Elementary were surprised with T-shirts and a classroom visit — awards for exemplary attendance. Those “caught” are: Antonio Ortiz, Ian Saephan and Siree Echeverria from Nicholas; and Lauren Valdez, Mekhi Hawkins and Paulina Ochoa from Oak Ridge.